When you live in Chinatown, you live in one of the most culturally distinct parts of the city. 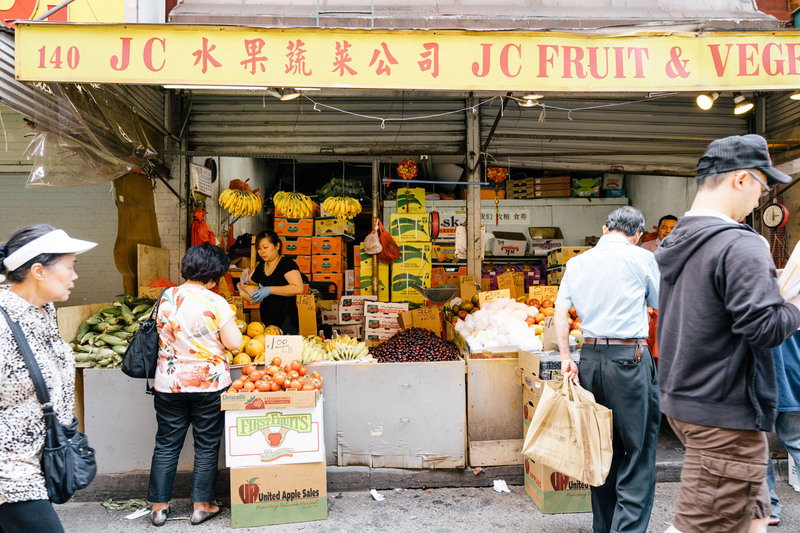 Many residents can trace their ancestors back for several generations, and a walk down the winding streets of the neighborhood will uncover local bakeries and Chinese groceries that have served the area for decades. This rich history hasn't stopped young professionals from moving here. In fact, that's part of its appeal, along with the many restaurants and bars popping up all over the area. The location doesn't hurt either, Chinatown is near to LES, Soho, and Tribeca while being served by the D, J, N, Q, and R trains and Manhattan Bridge which puts you a short taxi ride away from Brooklyn. The neighborhood is mainly low-rise, and Chinatown Apartments or Chinatown rentals are often in walk-up buildings located above traditional shops or restaurants. In recent years, however, a number of luxury condominiums have been built offering roof terraces with views of the East River, doormen, and other amenities. In contrast to the area's old-world vibe, many apartment interiors boast marble baths and modern fitted kitchens. 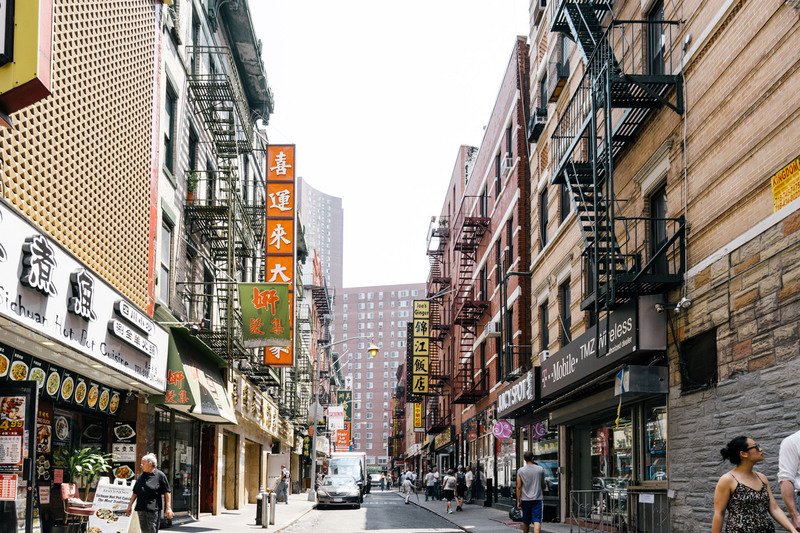 Manhattan's Chinatown is one of the oldest Chinese enclaves. Most immigrants were Cantonese and more recently Fuzhounese speakers. Initially, Chinatown started on Mott, Mosca, Pell and Doyer Streets. In the late 19th century, Chinese Tongs or 'associations' dominated offering protection from harassment due to Anti-Chinese sentiments. After the US enacted The Immigration and Nationality Act of 1965, allowing many more immigrants from Asia into the country, the population of Chinatown increased dramatically. 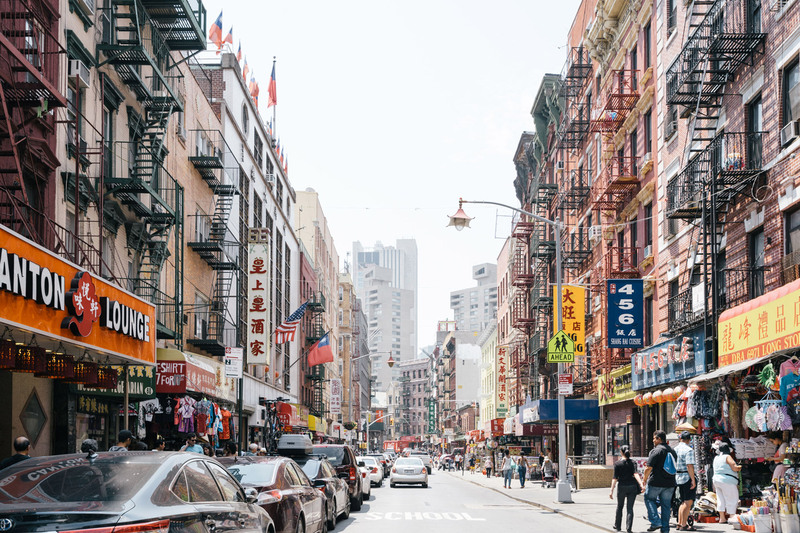 Today there are nine Chinese communities in New York and over 85,000 people in Chinatown, Manhattan. Perhaps the most famous event held in the neighborhood is the parade in celebration of the Lunar New Year. Each year it works its way through little Italy and Chinatown and includes the traditional lion dance, vibrant floats and lots of delicious street food. Founded in 1980, Museum of Chinese in America, or MOCA, is dedicated to preserving and presenting the history, heritage, experience, and culture of the Chinese in America. The museum space offers plenty of interactive exhibits and has a permanent collection of some 65,000 artifacts. Columbus Park is a center for cultural life in the neighborhood. It's a place where people come to play Chinese chess, practice tai chi and meditate. Sometimes you can see local musicians perform Chinese opera as well as traditional music. Yunhong Chopsticks Shop has around 200 different styles of the utensils lining their walls. They've everything from a plastic pair costing a couple of bucks to a mahogany pair for several hundred. Each set comes in an illustrated box and would make the perfect gift. Downtown Music Gallery specializes in adventurous music from modern jazz to art rock and contemporary classical. They stock both CD's and vinyl, and in the evening the store also doubles as a performance space. Part hardware store, part grocery, the New Kam Man emporium takes up three floors on CNo. 6 is a women's clothing store with a range of well-chosen independent European designers and their own collection consisting of items like clogs, boots, printed silk dresses and swimwear amongst other things. Finally, no visit to Chinatown is complete without a trip to Canal Street. It provides the quintessential neighborhood shopping experience with rows of narrow shops and stalls selling T-Shirts, scarves, jewelry, handbags, perfumes and watches. One of the best neighborhoods for eating out, there is no shortage of restaurant options in Chinatown. Num Wah Tea Parlor has been making dim sum since 1920, and their expertise shows. Here retro charm is combined with authentic made-to-order food like roast pork bun, scallion pancakes, and shrimp rice roll. Alternatively try Jing Fong, a banquet hall that occupies 20,000 square feet and offers some of the finest traditional dim sum in the city. Something of a community fixture, it's a great place to come with a large group of friends. Peking Duck House is unsurprisingly most famous for its Peking Duck, which is carved at your table. As well as the house specialty, it serves traditional Chinese cuisine like sweet and sour pork and General Tso's chicken. Mission Chinese Food serves inventive, genre-bending Chinese cuisine in an interior that boasts ornate chandeliers and velour banquettes. Dishes include Fiery King Pao or salt cod fried rice. As well as excellent Chinese food, the neighborhood has some great Vietnamese Pho places. Nha Trang One has a range of traditional dishes plus more inventive items like a bowl infused with satay sauce, while Pho Bang offers a broth packed with flavor and gives you the option of super-sizing your dish. In a clean, minimalist space on Canal, you'll find Chikarashi, a restaurant that focuses on Poke, a Hawaiian- style fishbowl. There are fourteen fish and rice options on the menu from roasted miso cod to Sichuan chili salmon. The health-conscious will enjoy eclectic menu at Dimes Restaurant, which includes acai bowls, spiced quinoa bowls, and drinks like a wheatgrass margarita. Asia meets Europe at the Malaysian-French bistro Aux Epices. Here traditional Malaysian dishes like chicken istinewa and Ikan pangpang mix with duck confit and French desserts. There are a number of cocktail bars in the neighborhood each with a different approach to the art of drinking. Based in a former opium den, Apotheke is styled to resemble a European apothecary. Even the mixologists wear pharmacist-style garb and the menu, or prescription list, features cocktails with organic produce, herbs, and botanicals. Tucked away underneath the diner Genuine Superette is Genuine Liquorette, a bar based on the aesthetic of a California Liquor store. As well as serving beers and cocktails, the bar runs a bartending program that lets amateurs learn to mix, shake and stir like a pro. Finally, Mulberry Project is a cocktail lounge that invites you to choose a liquor and an accompaniment or two, and then wait as the barkeep creates a specialty cocktail for you. If you're not feeling that adventurous, it also has a more traditional menu as well as small plates. Lastly, no visit to Chinatown would be complete without karaoke. K-One is an excellent place to go with a crowd and show off your singing skills. There are different room sizes for you to rent, the small rooms housing six people, the medium approximately twelve, and the VIP room thirty.